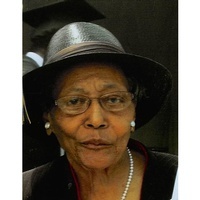 Isabelle G. Brown of Nalcrest, Florida passed away Wednesday, March 27, 2019 at The Grove Center in Lake Wales, Florida. She was born November 8, 1925 in Orange, Virginia to the late John and Edna (Minor) Gordon. She has been a resident of the area since 2014. She was a Homemaker and a member of the Promise Land Baptist Church in Washington, D.C.
She is preceded in death by her husband Lee O. Brown, sister Madeline Washington, 2 brothers James Gordon and Carroll Gordon. She is survived by her son Thomas Gordon and wife (Antonia) of Laurel, MD, daughter Barbara C. Holloway and husband Robert of Nalcrest, FL, son Kenneth Brown of Upper Marlboro, MD, 10 grandchildren, 14 great grandchildren and many nieces and nephews. Wake will be held 10:00 AM Saturday, April 13, 2019 with service at 11:00 AM at the Snead Funeral Home at 5732 Georgia Avenue NW, Washington, DC 20011 with interment on Monday, April 15, 2019 at 1:00PM at the Quantico Marine Base Cemetery in Triangle, Virginia.